Remember When Shazam! Was an Extremely Odd TV Show for Kids? Shazam is set to make his 21st-century cinematic debut this weekend, after having risen from a legal wasteland to join the very company that tried to wipe him out of existence. What was once a higher selling comic book than Superman will take the form of a visibly expensive, impishly funny movie, Shazam!, a far cry from the last time Batson made it to the big screen: the beloved, limited budget 1941 film serial The Adventures of Captain Marvel. There’s a project between those bookends, however, that’s just as revealing of the life span of a superhero. The live-action Saturday-morning series Shazam! 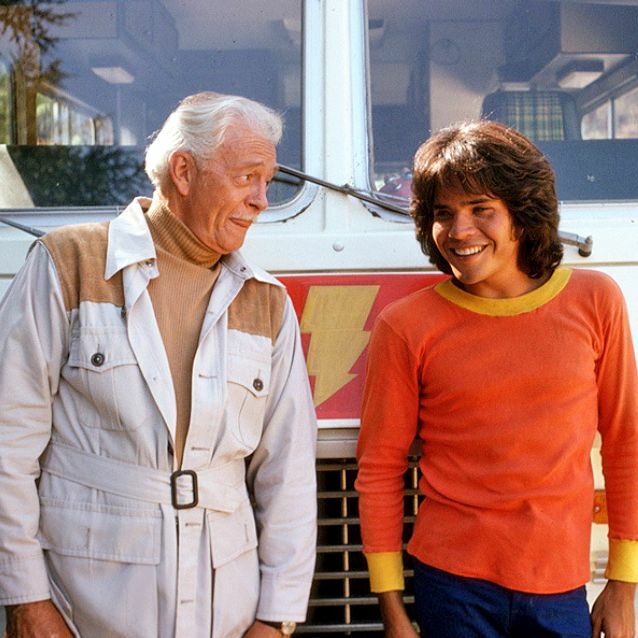 ran for three strange seasons between 1974 and 1976 — the only era during which a TV show would have thought to pair Billy and an older man known only as “Mentor,” stick them inside a Dodge motor home, and send them on an aimless journey helping one troubled young person after another. Without a supervillain or a portal to another world in sight, Billy and Mentor had to settle for solving smaller-scale, but socially relevant, problems. A few circumstances converged to make this Shazam! possible, starting with the return of our superhero to the comics pages. Billy Batson — a.k.a. Captain Marvel, a.k.a. the boy who could become a superpowered adult man by speaking his magic acronym (Shazam is comprised of the first letters of the names of six “immortal elders”) — was born at Fawcett Comics in 1939. But after almost 15 years of getting struck by lightning in order to accrue the power he needed to annihilate bad guys like Dr. Sivana, a copyright-infringement lawsuit launched by National Comics ended his run. The company that would later become DC Comics objected to his resemblance to a certain other speedy, blessed-with-the-gift-of-flight, Herculean hero (Superman). So Fawcett, after years of litigation, settled out of court, ultimately ceasing production of Captain Marvel’s comics. It wasn’t until 1972 that Fawcett decided to revive the character by licensing Captain Marvel to the only company it legally could: DC Comics. This peculiar arrangement (and a trademark complaint from the by then established Marvel) led to the reestablishment of Captain Marvel as Shazam; same character, different name. The revived story explained that Shazam and his supporting cast had been stuck in “suspendium” for a while, but here he was, red cape and everything. It wasn’t long before a TV series followed, produced by Filmation, a company responsible for animated versions of Superman, Aquaman, and Batman, as well as series featuring Archie, the animated Star Trek, and Fat Albert and the Cosby Kids. Shazam! found the company venturing into the world of live-action while holding on to some of the techniques it picked up from animation. That’s a polite way of saying the series looked cheap. Filmation’s beautifully designed characters do a lot of standing, set still against the same backdrops that are used in episode after episode. Retaining that approach, Shazam!’s own animated sequences show Billy, prompted by a blinking device on his motor home’s dashboard, being transported to the company of an animated council of Immortal Elders (voiced by an uncredited Adam West and others). In his semi-hallucinatory state, the elders bestow upon Billy cryptic words of wisdom (and Wordsworth quotes) before returning him to consciousness to tackle that week’s adventure. In order to finally transform from a boy named Billy into an adult superhero named Shazam, he’d exclaim his magic word … and then wait a couple seconds. The clunky metamorphosis involved awkward shots of Shazam’s flying body (the torso, at least) cut after frames of him bounding off what is certainly a trampoline. The effects don’t just fall short of contemporary standards, they don’t live up to the standards set by the beloved ’40s serial. They are, however, endearing, much like the show around them, which fills its episodes with easy-to-digest lessons for younger viewers about drugs (bad), joyriding (bad), the plundering of Native archaeological sites (bad), and communication (good!). And, lest anyone miss the point, Shazam returns at the end of each half-hour outing to restate the moral of the day in direct address to the camera. Featuring guest stars like Jackie Earle Haley and Danny Bonaduce, the installments play out like educational shorts peppered with superhero action, with a good-for-you quality common to many projects from Filmation, which would later add similar closers to He-Man and the Masters of the Universe and other series. Good for them or not, kids turned the show into a hit, one of the few live-action shows not produced by Sid and Marty Krofft to have staying power in a Saturday-morning lineup dominated by animated shows. They apparently never cared that the shaggy-haired Michael Gray, who starred as kid Billy, was clearly in his early 20s and presumably too old to need to learn the sorts of lessons offered by the show. Nor did they object to a spinoff, Isis, that was essentially the same show with a female protagonist. Nor did they seem to question why Billy would be on a permanent vacation with the testy Mentor, played by veteran TV and radio actor Les Tremayne. (In an early episode, Billy mentions taking a break from the radio station where he works in the comics, presumably an organization with unlimited PTO.) But they could hardly have missed the show’s most bizarre development: the mid-series replacement of one Shazam actor for another. Two episodes into filming Shazam!’s second season, the series parted ways with star Jackson Bostwick under disputed circumstances, allegedly firing him after he failed to show up for a day of shooting. Bostwick sued Filmation and won, claiming he was seeking medical help after an on-set injury, a not-outrageous claim given that he performed many of his own stunts. (That he had home movie footage as evidence probably didn’t hurt.) Filmation hired John Davey to step into the part, and the substitution was hard to miss. Where Bostwick was slim and agile, Davey was beefy, appearing less like a superpowered being shaped by the gods and more like an easily winded football coach. It’s a switch that makes Roseanne’s transition between its two Beckys look seamless by comparison. Then again, it’s not like Shazam! worried much about seams elsewhere. It’s earnest, cut-rate kids’ stuff that reflects precisely the respect afforded comic-book characters in that era, before they had to have the power of Zeus and the stamina of Atlas to shoulder films costing hundreds of millions of dollars with global box-office appeal. When a superhero’s duty more often meant standing up for a teenage girl whose sexist teachers wanted to keep her off the track team or rescuing a kid from a mountain lion as part of a lesson about anti-Semitism, rather than saving the world. These were humbler tasks, sure, but in their own way just as heroic.